Just recently l was in conversation with someone that had been working in the same organisation for 15 years, and had been offered a new job in another. He mentioned the reason for the change was that ‘it was time to change the job’, and that he was ‘no longer enjoying the role’. I was delighted for him as the move would have meant a change for him, his family, friends and even his colleagues. HOW DO YOU KNOW WHEN IT’S TIME TO CHANGE YOUR JOB? You know when you have outgrown your job because you are at the point of moaning and complaining continuously about it. The drive and enthusiasm is no longer there. Whilst you continue to moan about it, that negative energy affects your family and friends, irritates your colleagues as they too are tired of hearing you whining. It may get to the stage where your colleagues either try as much as possible to avoid conversations to do with work, or find ways of totally blocking out your continuous whining. What constant whiners do is to try to make you feel their frustration, in the hope that you will help them in doing something about it. We all have to tend to our own overgrown lawns eventually, only that some of us may not be quite ready yet, so therefore able to put-up with it a lot longer. It is time for change! Then you get home and the whining continues. Your complaining about the job, your colleagues, the travelling, how stressed you are. You may not even realise that you are constantly complaining about anything and everything. When we are unhappy it is those that are closest to us that bear the brunt of our frustration. You get easily irritated, angry, sulking, short tempered. This is all about your dissatisfaction and not anyone else’s. It’s time for change! When you have exceeded your ‘sell-by-date’. Somewhere during the time, you took the job until now, you probably set yourself some personal goals and targets to meet. One of them may have been to only stay for a period of time. You have now exceeded that period, you are still there, and worse still no longer enjoying it. It is time for change! When the question ‘what’s in it for me’ mind-set arises – it is time for change. When you initially started the job you had an enthused mind-set – one that was eager to learn etc. 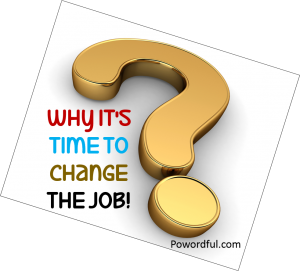 The ‘what’s in it for me’ attitude has developed because the role no longer fits or serves your needs – you have outgrown a job that once appealed to you. When you are given tasks to complete you may find yourself scrutinising it to find out ‘what’s in it for you’. If there is nothing there any longer for you, there may well be for someone else in the role. It is time for change! When you are ‘shrinking to fit’ in your career, you are likely to be ‘shrinking’ in other aspects of your life too. We all have to make adaptations in our lives that enables growth, otherwise, we become static or feel trapped. The stimulus related to the job is now dissipated. If there are no other opportunities within the organisation, it is those that are brave enough that will make the change and leave. It’s time for change! Change is an individual choice which when prolonged will inevitably affect other aspects of your life. Change is a positive development pushing you beyond your ‘comfort zone’. So you can now understand the depth of my enthusiasm that he had got a new job. Perfect, I’ve taken just for now jobs in the past to pay the bills and make ends meet only to find that I’ve been there way pass the sell by date as you put it. Sometime we get comfortable in the uncomfortable and if the perfect jobs not out there we convince ourselves better the just for money job we are in then look for another of the same. But now I’ve learned excatly what you said above. There will be no more shrinking just keep it moving. Thank you for the reminder. Perfect, I've taken just for now jobs in the past to pay the bills and make ends meet only to find that I've been there way pass the sell by date as you put it. Sometime we get comfortable in the uncomfortable and if the perfect jobs not out there we convince ourselves better the just for money job we are in then look for another of the same. But now I've learned excatly what you said above. There will be no more shrinking just keep it moving. Thank you for the reminder. Glad you found the message useful and as a reminder to ‘keep it moving’. The message is coming from the heart. Glad you found the message useful and as a reminder to 'keep it moving'. The message is coming from the heart.